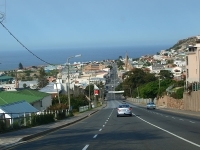 Mossel Bay is the largest city on the Garden Route and is situated roughly half way between Cape Town and Port Elizabeth. It is renowned as the Adventure Capital of the Garden Route and enjoys an ideal climate with an average of 320 days of sunshine per year and a moderate winter. Mossel Bay was discovered by Bartholomew Dias who in 1488 became the first European to land in South Africa. He was rounding the southernmost point of Africa, Cape Agulhas, when a strong wind blew him off course, into the protected bay of St Blaize, now called Mossel Bay. Here he found fresh water and set up a stop-over point for trade ships that were sailing to the East. Many explorers and traders placed important letters in an old shoe under a huge Milkwood tree which is now more than 500 years old. Today, letters are still posted from the Old Post Office Tree. Adventure junkies come to Mossel Bay for a range of activities in the immediate vicinity: shark cage diving; sand boarding the longest sand dune in South Africa; feeding, riding, and picnicking with elephants; safaris with the Big Five; exploring the predator park where you can view white lions and tigers; tandem skydiving; dolphin and whale watching boat trips; scuba diving; abseiling; helicopter flights, and more. Other more sedate attractions include the largest shell museum in South Africa; an indigenous botanical garden with a braille trail fragranced for the sight impaired; a life-sized replica of Bartholomew Dias' caravel style ship; St Blaize Lighthouse and cave; and several world-class golf courses. Mossel Bay is also well known for its wide selection of restaurants and excellent seafood. Many different types of accommodation are on offer, from budget backpackers to five star hotels. There are eight sandy white beaches to relax on and enjoy the sunshine. Whether you want to play or relax, Mossel Bay is an ideal destination and the perfect base for exploring the magical Garden Route.